The Mathematics Research Centre (MRC) runs an extensive programme of research activities in mathematics. The main ingredients in this programme are year-long research symposia and shorter, more specialised, workshops.SYMPOSIA The topic of a symposium is broadly based and usually one in which there is a strong interest in Warwick. The symposium is organised by members of staff in Warwick, often with external help. The organisers are free to invite participants from the world-wide mathematical community to work in Warwick during the year. There will be mathematicians, including the leading figures in the area, visiting Warwick throughout the year, a weekly programme of seminars, and various special events which act as focal points in the symposium. Typically a symposium attracts something like 500 participants each year, who stay in Warwick for periods ranging from one week to the full year, and there are eight to ten special events which take place in the University vacations. The aim of a symposium is to provide an informal research environment designed to stimulate interaction between the visitors and the resident mathematicians. The programme of workshops is designed to be flexible and to diversify the research activities of the MRC. Workshops are smaller, shorter, and more specialised than symposia. The aim of a workshop is to gather together a critical mass of mathematicians to work together in some quite specific area of mathematics. The organisation of the workshop depends on its objectives: it may be focused on a specific topic in mathematics, designed to generate interaction between different specialities within mathematics, or it may involve interdisciplinary research. It could last a week or a month, and may involve as few as ten or as many as fifty participants. The MRC was founded in 1965, with the help of a grant from the Nuffield Foundation. This grant enabled the MRC to begin running research symposia, and each year since 1965 there has been a symposium in some area of mathematics. 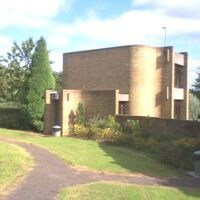 It also provided the funds to build the Mathematics Research Centre Houses which are situated close to the Mathematics Department and are used by visitors to the MRC. The programme of workshops has developed over recent years as a means of expanding and diversifying the programme of the MRC and in response to the increasing demand to put on interactive research activities of the kind the MRC specialises in. Over the years the MRC has earned an international reputation for the high quality of its activities. The MRC is an integral part of the Mathematics Department at Warwick and the activities of the MRC are, in general terms, based on the interests and expertise present in Warwick. This has many advantages; visiting mathematicians come into a well-established and lively mathematical atmosphere and since they constantly interact with the mathematicians and research students in Warwick, their visits have a lasting effect. The MRC has a characteristically informal atmosphere and the "open house" policy allows anyone who wishes to visit Warwick to do so.